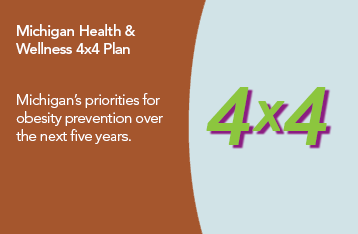 In June of 2012, the Michigan Department of Health & Human Services launched the Michigan Health and Wellness 4×4 Plan, which contains Michigan’s priorities for obesity prevention over the next five years. The goal of the Michigan Health and Wellness 4 x 4 Plan is for every Michigander to adopt health as a personal core value. The plan describes the approach that the State of Michigan will undertake in addressing wellness and obesity. Greater Flint Health Coalition is one of five community coalitions charged with implementing the 4 x 4 Plan. The GFHC’s implementation of the 4 x 4 Plan is done in collaboration with Genesee County’s community-wide health behavior improvement strategy, Commit to Fit. The Michigan Health and Wellness 4 x 4 Plan includes a statewide, multimedia campaign, MI Healthier Tomorrow, to engage overweight and obese adults to pledge to lose 10% of their body weight. Statewide partners from business, education, corporate/trade, healthcare, and community organizations are implementing obesity reduction strategies within their statewide sphere of influence, and departments of state government engaged in effecting policy, system and environmental changes to improve healthy eating and physical activity. 4 x 4 Plan funding seeks to bring together community partners and implement evidence-based solutions to increase opportunities for physical activity and healthy eating. The healthcare community is engaged to promote the 4 x 4 Tool in the clinical setting. The 4 x 4 Tool recommends the practice of four healthy behaviors (healthy diet, exercise, annual exam, avoid tobacco) and managing four health measures (body mass index, blood pressure, cholesterol, blood glucose). Funding for the GFHC’s 4 x 4 Plan activities in Flint & Genesee County is provided by the Michigan Department of Health & Human Services. For more on the GFHC’s 4 x 4 Plan strategy and evidence-based interventions in Flint & Genesee County, visit www.commit2fit.com.